Vietnamese shares underwent another strong decline on Tuesday as investor sentiment remained negative following the selloff that had spread across global markets. The benchmark VN-Index on the HCM Stock Exchange shed 3.54 percent to close at 1,011.60 points, recouping a part of its loss of as much as 6.26 percent. The VN-Index has decreased by a total of 8.4 percent after the last two trading sessions. By Monday, the VN-Index had gained a total of 12.2 percent since the beginning of the year. The HNX Index on the Hà Nội Stock Exchange dropped 2.78 percent to end at 115.64 points. It had lost as much as 7 percent during the session. The northern market index has totalled a two-day reduction of 6.7 percent, erasing its 6.1 percent growth made since December 29. The UPCoM Index on the Unlisted Public Company Market (UPCoM) fell another 3.48 percent to finish at 54.95 points. It has lost a total of 7.6 percent after the last four sessions. The market trading liquidity reached historic highs in terms of both volume and value with more than 631 million shares being traded across the three exchanges, worth VND17.4 trillion (US$776.6 million). The last two-session decline has wiped out $14 billion of the market capitalisation, reducing the total market capitalisation to $160 billion at the end of Tuesday. Nineteen of the 20 sectors on the stock market saw share prices drop, including energy, financial-banking and construction businesses among the worst-performing. The number of declining stocks was almost five-fold that of gainers by 585 to 124 on the three local exchanges, while 98 other stocks remained unchanged. Blue chips continued to trade negatively as 24 of the 30 largest ones by market capitalisation in the VN30 Index declined. The VN30 Index was down 2.64 percent to end at 1,007.72 points. 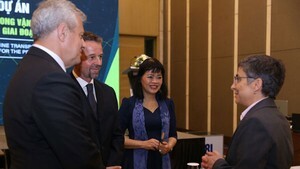 The biggest decliners among Vietnamese shares that had negative impacts on the indices included FLC Faros Construction (ROS), Bank for Investment and Development of Vietnam (BID), petrol dealer Petrolimex (PLX), insurer Bao Viet Holdings (BVH) and budget carrier Vietjet Air (VJC). Those stocks were down at their daily declining limit of 6.9-7 percent while other stocks lost between 0.4 percent and 6.5 percent. 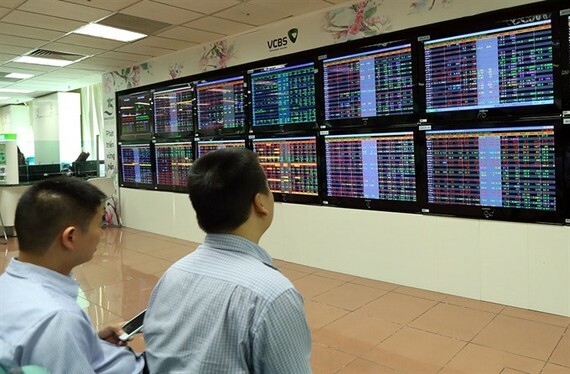 The current volatility of global stock markets was still the main reason driving local stocks down on Tuesday, according to Bao Viet Securities Company (BVSC). “Due to the plunge of global stock markets on Monday night, the VN-Index sank on Tuesday with an increase of selling pressure in blue-chips,” BVSC said in its daily report. “In addition, the market was in a state of a complete panic as investors feared that the Dow Jones already hit its peak after a streak of gains,” the brokerage firm said. Given the fact that the US market showed little rise, leaving the possibility of a recovery later on Tuesday, BVSC forecast that investors would soften their selling pressure on Wednesday, however, it remained uncertain about a sustainable rebound at the current price range.